Comfortable With Padded Extra Wide Bath Bench. This extra-wide bath bench is also extra-comfortable, with a generously padded seat divided into sections that let water drain through. The comfy backrest is also well padded for a more relaxing bathing experience. 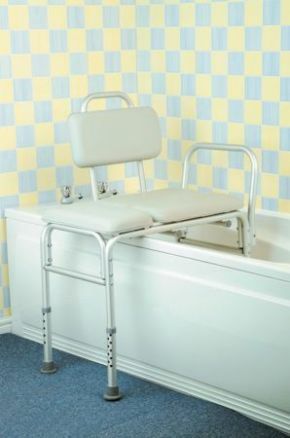 A wide bath bench makes getting on and off easier and this model also comes with sturdy handles to provide more support and reduce the need for grab rails. It can be used on either side of the bath, depending on the way it is assembled. The two shorter legs go inside the bath and the two longer ones outside. Overall, this is a comfortable, very functional bath bench that will improve both safety and bathing enjoyment. Very pleased with this item , its lightweight yet very sturdy and very padded so is lovely to sit on. I have used bath benches in the past , yet this one feels a lot more secure. Very quick delivery within 2 days from place of order. 5 stars.